“I used to dream about you getting hit by a cab or poisoned. Then we had our little adventure up in Alaska and things started to change.” That’s how radical the change that happened and it all started with the proposal. This mild, romantic comedy might not be an Oscar-winning movie but it has its own good points that made it a must-watch especially if you are a Ryan Reynolds’ and Sandra Bullock’s fan. For three years, Andrew Paxton, played by Ryan Reynolds, has been a loyal and ever hardworking executive assistant to Margaret Tate, played by Sandra Bullock, a pushy, uptight and hard-driving editor at a New York publisher. Andrew was actually pretty much being a slave to Margaret all this while. However things change when Margaret, who is a Canadian, faces deportation back to Canada due to an expired visa and hence she made Andrew to marry her in order to save her job and get a divorce later. Then, it still won’t be easy as the immigration officer, Mr. Gilbertson, played by Denis O’ Hare, is going to breath down their neck until he manages to uncover what he believes to be a ploy. Both Margaret and Andrew then fly to Alaska in order to convince Andrew’s family to get married but many heart-tickling incidents occur all the way until the end. It isn’t going to be pretty but it will be funny for sure. The chemistry between Sandra and Ryan in this movie seems to work very well indeed despite Sandra being a bit too old for Ryan. It can be seen that throughout the movie, Ryan steals the thunder most of the time, which makes up for his dry comedy thing. Without any doubt the golden 87-year old Betty White is a stellar in this movie as she plays the wise and saucy hot grandma in the Paxton’s family. Anyway the message from this movie is what interests me the most. 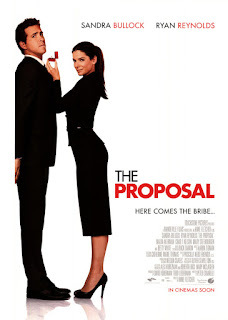 This movie portrays a love that can occur even between the two that have been in mutual disdain and it all starts with the proposal. Love can actually work its magic if anybody is willing to give it a chance. All in all, this comedy is worthwhile watching and it is surely entertaining as it does to me. Even in this movie, they didn't actually love each other. The proposal initially was just a ploy but it turned out to be serious later on. See, my point is, love after marriage does happen, and it seemed to work out even better than lovey-dovey stuff before marriage that most people indulge into nowadays (well, at least it was portrayed that way in this movie). Got it peeps? Kahwin dulu baru bercinta kay? ana tengok dalam flight singapore airlines. itu je kot movie yang macam bagus dalam flight tu, sbb singapore airlines banyak xtapis movie.